You may have been asking yourself, "how can I make money while working from home?" 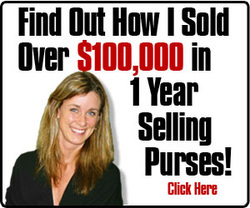 One of the great ways to make money at home is to have a purse party business. This is great for someone that is fashion conscious and wants to do something productive in this field. When you start a purse party business, you will need to find legitimate purse party companies that will supply you with your merchandise. A purse party is a get together in a home of a group of women that are interested in stylish bags and purses. This provides a great networking and socializing avenue in a fun and relaxed environment. As a purse party consultant, you will attractively display a variety of fabulous and chic bags for the women to peruse and buy. When selling stylish bags and purses, it is important to be ethical in your business practices when you run your small business. One thing to remember is to not sell fake or counterfeit bags especially fake designer bags. Selling counterfeit merchandise is illegal and totally not worth it. There are several books on the market that teach you how to identify a fake compared to a real bag. Selling fakes is considered illegal and messing with the law is not something I want for myself. If still in doubt, you can call or email the companies to verify. The legitimate companies that you should use for your purse parties should be able to offer home business opportunities for individuals looking to venture into handbags, jewelry and fashion accessories sales by hosting purse parties. You can certainly add jewelry and other fashion accessories to your main merchandise of purses when you host a party. A legitimate company should show you how to start your own full or part time work from home purse party business without sacrificing your personal life. The reason that you probably want to work from home is probably so that your personal life can improve without having to report to an unreasonable boss and work long hours and weekends. The guidance provided by legitimate companies will be invaluable and will teach you how to successfully run your business so that you can make money at home to replace or supplement your current income. The support system is invaluable so that you do not feel as alone. The bottom line is that before you start this business, please ensure that you deal with a legitimate purse party business so that you can keep yourself out of jail by not selling fakes or knockoffs. If you are looking for a way to transition smoothly from working outside the home to working at home because it shall allow you plenty of time to spend with the kids and family or whether you are simply sick and tired of making someone else wealthy, purse parties are the way to go. This article discusses how to have a successful at home business hosting purse parties and make significant amounts of money. Handbags have been elevated to the unique, spectacular and the "must have" for the season. Women are constantly looking for the next, "it" bag that catches their eye that they just have to have despite having a ton of other purses in our closets. We simply get bored and need something new to show off while complementing our outfits. A fabulous purse makes all the difference in polishing off an outfit. From designer to replicas, from the extravagantly priced, to the modestly priced, handbags can be found everywhere at trade shows, flea markets and various shops around the world. Various designers make most of their income from their handbag and accessories collections than their clothing or shoes. You do not need to be a certain size to rock a fabulous purse. With this in mind, purse parties are all the rage because of the constant demand for purses. A purse party is a gathering of women or other interested parties interested in chic and affordable purses. This is also a great networking opportunity in a relaxed and fun environment. What is more than trying on various fabulous purses? Organizing a perfect purse party that will allow you to replace or significantly increase your income can be easy as long as you use the right resources to help you with each step as a purse party consultant. Following the steps provided will ensure that this business becomes a lucrative business venture and allow you to become the master of your destiny. You will first need to find a reputable company that will provide you with a wide selection of purses for you to choose from. With a professional purse company, you shall be able to book a purse party, become a consultant and purchase your purse supply and you may also purchase accessories to also display attractively at your purse party. You shall be paid a commission for any sales at your purse party by the purse party company that you go with. Although you will be responsible for determining what kinds of purses you would like to offer, it is important to determine the needs of the guests so that you provide the kinds of purses that they would be interested in and purchase. If they are interested in authentic designer purses, find a purse company that offers these at a reasonable price. If they are interested in other brand name purses, you shall be able to find purse companies that offer these. People usually expect to see quality, stylish purses at reasonable prices. Attractively display your merchandise at the party and arrive up to an hour before the start of the party to set up the purses and any flyers and catalogs. Provide light finger food and drinks. Also ensure that you have business cards on hand so that you guests are able to reach you at future times in case they would like to book you for a party they are hosting. At the close of a successful party, you may want to announce that the guests can obtain discounts or a commission if they host their own purse party. Advertise your purse parties on bulletin boards, Craigslist, email and send out invitations periodically to people that you know in order to attract more customers to your purse party. Purse parties are an excellent way to have fun in the company of friends and acquaintances so knowing this will allow you to be successful at this at home business. The growth of this business is entirely up to you whether you would like to simply host purse parties throughout the year or move on to recruiting others across the state or country to host parties. 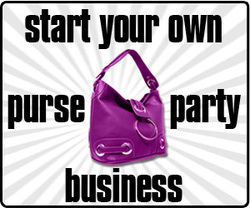 Purse parties are an excellent way to work from home while making a significant amount of money. If you are fashion conscious or obsessed, this is a great way to make money while doing something that you love to do and not dealing with an unreasonable boss. Purse parties also offer a great networking tool especially for career women that need a way to relax after work while networking with other women. Purse parties are a great way to get together in a home by a group of women or others who are interested in stylish and fabulous purses and bags in a fun and relaxed environment. While providing this social aspect, it allows the purse consultant to show a variety of chic bags and purses for the women to try out and ultimately purchase. If your merchandise is good, the women will buy. To set your party apart from the rest, you may want to consider a theme. This simply means that you are taking this at home business seriously while having fun too. Theme or no theme, women are always in the market for a new purse and we can never have enough! Be sure to provide drinks and finger food for the guests. There is no need for any lengthy presentation or elaborate themes and you do not need to spend a lot of time playing party games. Your main focus should be ensuring that your merchandise is appealing and varied as well as being of a good quality. If you excel at this, you will not have problems having repeat business which is always the goal. Who can resist a fabulous new bag even in this economy? All you need to do is ensure that you are professional in your presentation and dress appropriately so that everyone knows that you are providing this service as the hostess of the party or providing this service for another. Share your knowledge and be enthusiastic in your presentation. That being said, you do not have to limit yourself to a Saturday or Sunday afternoon when people are free. A purse party theme can include a Bachelorette party, baby shower, housewarming party, girl's night out, bridal showers and so forth which all give the ladies a chance to unwind in a fun and relaxed environment. You may even designate a portion of the sales to a charity dear to your heart. Purse party themes are only limited by your imagination when coming up with a way to get the ladies together to do some shopping and save some money while socializing. It is important to know that the relationships in our lives have the potential to increase our level of happiness if they are functional. You will be providing this environment for positive relationships to grow while making money at your home based business. In addition, the holidays are always an excellent excuse to get together and do some Christmas shopping. Why not have a purse party or several purse parties during this time as well. Since the holiday season is a great time to host purse parties, you will need to focus your resources and time during this period. The focus will relate to obtaining the best quality merchandise, increasing your mailings, including postcards, thank you notes, newsletter and emails while noting the gift giving aspect of the season and the saving that can be made by attending a purse party in your communications. You can even have one of the attendees host the next party at their work place during the lunch hour. All you would need to do is provide them with a discount or free merchandise or even a portion of the sales as an incentive. They will need to arrange with their employer certainly to use a lunch room or boardroom but this should not be a problem since this is a great team building experience. Purse parties have started gaining popularity in recent times. If you love your purses and are looking for an at home business, you may want to seriously consider becoming a purse party consultant and either supplement or replace your income. Before you take the leap, this article addresses the keys to success. This is a party at a home where a group of women gather to socialize as well as buy stylish purses in a friendly and stress free environment. As a purse party consultant, you would be providing a selection of chic and stylish purses for the attendees to select and hopefully purchase. You may be able to get designer purses if you have the proper supplier but you need to be sure that they are authentic designer purses as there has been a crack down on purse parties featuring counterfeit designer purses. Purse parties are usually well attended and provide excellent sales potential since they are great for socializing and networking in addition to providing a great selection of fabulous purses. I do not know any woman that is not purse obsessed! If it is at a great price, what could be better? The purses featured will need to be displayed attractively to stimulate buying while offering snacks, desserts, drinks or coffee to make everyone comfortable and relaxed. Some parties feature fashion shows to entice the women and allow them to touch, hold, and try on the purses before they buy. Some parties may feature a game or two just to break the ice which may not be necessary because when women see stylish purses the first instinct is to flock to the display to touch and feel. Although a lot of purse parties are unregistered, it is important to register the business to avoid legal issues in the future as well as providing certain tax advantages for a home based business. Visit your local Chamber of Commerce and they will surely guide you in the right direction to start your small business. The small business branch may even offer some small business loans to help you with start up capital. I highly encourage you to utilize the small business resources offered by the Chamber of Commerce. To successfully start your business, you need to find a source for your purses. There are several leading suppliers of purses and you just need to determine which supplier will work for you based on their prices and purse selection. You will need invitations, a calculator, a book to collect email addresses, refreshments, and a box to hold your money received. Organization is key to success. If you decide to accept credit cards, you will need to have a merchant account which really is not necessary at the beginning of the business venture. Once you host a successful party, you can then recruit one of the attendees to host the next party by offering incentives such as a free purse, a discount or a portion of the sales received. These parties are usually so much fun so recruiting an attendee to host a party should not be a problem. You can advertise on bulletin boards, on Craigslist, or deliver flyers door to door. If you have a successful party, this will be an excellent opportunity for word of mouth advertising. The internet also has a whole host of advertising opportunities. It is completely up to the purse party consultant if you want to keep this venture small or build it into a very lucrative business where other do most of the selling for you at some point. It is totally and completely up to you.